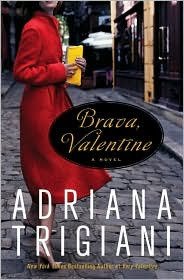 I was lucky enough to have the chance to review Adriana Trigiani's latest book, Brava, Valentine, for Library Journal. Here's the review, as it appears in the January 15, 2010 issue, reprinted with permission. The second novel in Trigiani's Valentine trilogy (after Very Valentine) brings back Valentine Roncalli and her argumentative but loving Italian American family. With her grandmother remarried and living in Italy, Valentine and her brother are now in charge of the Angelina Shoe Company. She's a strong businesswoman, but family and romantic relationships knock her off stride. The marriage problems she sees in her own family don't allow her to trust in a man or her own happiness. Her discovery of a family scandal that leads to Buenos Aires only stirs up more family troubles and romantic difficulties. And the loss of a beloved friend forces Valentine to question her future and look past tearful farewells for love and happiness. VERDICT Trigiani spoke to women's hearts with Big Stone Gap, and her Valentine series continues to do so. Brimming over with life, her latest will be essential reading for fans of humorous, touching family fiction. Trigiani's readers will be hard-pressed to wait a year for the final installment, Ciao, Valentine. Copyright ©2010 Cahners Business Information, a division of Reed Elsevier Inc. Reprinted with permission. FTC Full Disclosure - My review copy was supplied by Library Journal, for review purposes. It has been a long wait since Very Valentine, that's for sure! I loved that book and can't wait to read the second book (a review copy should land in my mailbox next week, yay!). I loved the first Valentine book. Trigiani at her best. Nice review. Thanks, Mary. You're right, these are Trigiani at her best. I wore down on the Big Stone Gap series. But, I love Valentine, and I like this series. Enjoy! Trigiani is one of my favorite authors, so I'm glad to see this is going to be a great series! I can't wait to read it. I haven't read her first book, so now I have 2 books on my TBR list! Thanks. Lucky lucky you! I love Verd Valentine. Such a wonderful story. Trigiani tells it like no other. Can't wait to read this one. Perfect Valentine reading, Bermudaonion, in more ways to one! It is going to be a good series. You're welcome, Elizabeth. You do want to start with Very Valentine, and meet the entire family. I did feel very lucky, Kaye. I've had some good review copies from Library Journal lately - Leila Meacham's Roses, Saving CeeCee Honeycutt, and, now, Brava, Valentine. I hope they keep coming! I'm so glad that you found this second book to be as good as the first one. I can't wait to read it, I'm a big fan of Adriana Trigiani's work. I'll be getting a review copy soon and I'll probably push everything aside to read it! I love your Library Journal reviews Lesa! I found out about Saving CeeCee Honeycut from your reviews, one of my favorite books of the year. Thank you, Bonnie! I've just been very lucky in the books I've been sent to review lately. I could honestly say how much I liked them, and that I thought others would. I know you'll like Brava, Valentine! Interesting new twists in this story - very appropriate ones. You'll want to read it as soon as you get it, I'm sure.